Now. Both of these games I'm here to tell you about today are not very intellectual. Not very intellectual at all. However, if you have small children, you are likely to identify these games as having great kid appeal. And if you stay with me here, you'll find information concerning a giveaway at the end of this post! I accurately predicted that my kids would love Crocodile Dentist . Small and compact, with no small pieces attached, this game is rather ideal for toddlers. My two year old appreciates this game the most but my four and six year old are just as entertained by it. The unit fits in the palm of an adult sized hand and is complete as you see it. The idea of the game is akin to the game of hot potato: you take turns pressing down one tooth at a time until the crocodile's mouth closes. Each time the game is "reset" (accomplished by re-opening the crocodile's mouth) and a different tooth then acts as the trigger. As an adult, there is perhaps little appeal to this game. It does not present much of a challenge. But a young child lives in fear of having his or her finger chomped off by a crocodile and that idea is wildly exciting. Wildly exciting, I tell you! 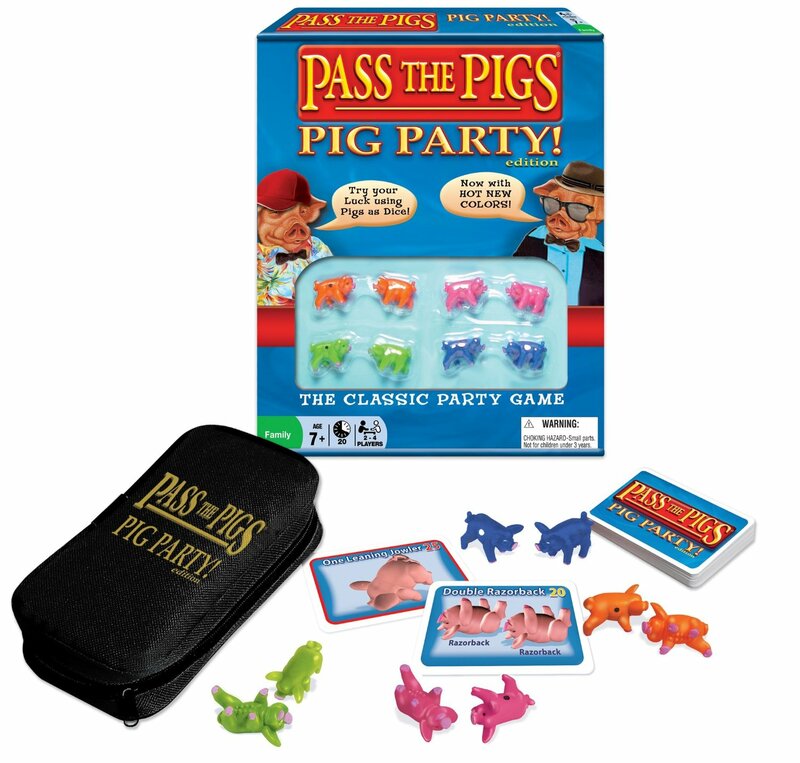 I remember playing a game of Pass The Pigs when I was younger and thinking it was SO FUN! It's a little less so as an adult (truth) but all of our kids got a big kick out of this one. The object of the game is to be the first person to reach 100 points and the points are collected by haing each player toss their own pair of pigs until they land in a particular position. There are twenty roll cards, all which show the pigs in various positions. Flip a card over and the players take turns in a circle trying to throw their pigs in such a way to have their pigs land appropriately so that they may collect the card and the points. The first person who collections 100 points worth of cards, wins the game. It's very simple and very straightforward, but it should be noted that it feels time consuming (to the adults). This game doesn't require a whole lot of thought as you might imagine. Mostly it's about the novelty and the fun of being together and playing a game as a family that even the youngest of us can understand. And that is, indeed, worth something. If you DO like playing games as a family - and especially with your kids - you will be delighted to know that Winning Moves has offered to give away one copy of the each of the above games to one of you! How to win? Simply leave a comment below. This contest is open to US Residents only and will be open through Thursday, September 5th. THIS CONTEST IS NOW CLOSED. The winner, as selected by Random.org, IS #!0- Alison. Congrats! Thanks to Winning Moves who sent samples of the above games my direction in order to facilitate this review/giveaway. I have received no additional compensation for this post. All opinions are 100% my own (should you doubt it). I haven't played Pass the Pigs in years. 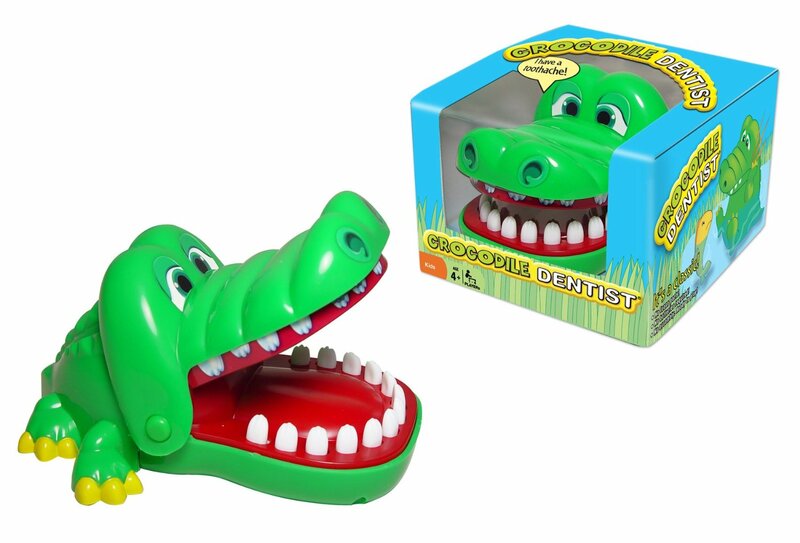 A friend of mine had Crocodile Dentist, and our kids loved playing with it. Fun idea! M is to the age now where he loves games. He would very much enjoy these! Near the end of Chutes and Ladders, the chutes shut down. Travel games are sorely lacking around here, so we'd love to win!